Five Acres (Parcel 141) was a small rectangular field of Preston Lower Farm. 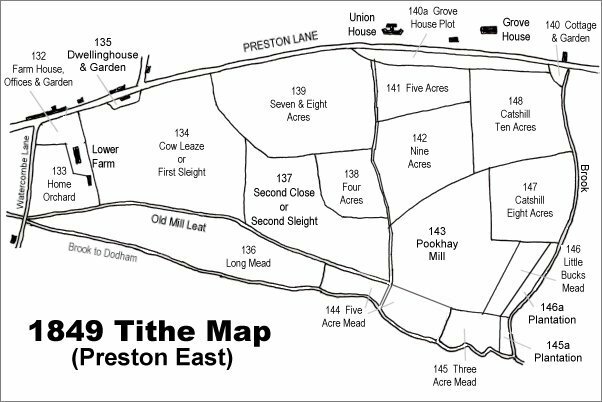 The 1848 Preston Tithe Apportionment noted that Five Acres was owned by Robert Tucker and occupied by Joseph Roberts. The Apportionment recorded that the field was arable and measured, unlike its name, just 4a 1r 10p. All eight fields of Lower Farm whose names suggested an acreage such as Three Acre Mead, Four Acres, etc., were actually less than their names would suggest. However this is due to the use of 'Statute' measurements in the Apportionment which were actually smaller that 'Customary' measurements. Five Acres was bounded on the west by the brook that flowed south from Preston Road by the Union Workhouse and joined the Old Mill Leat in the corner of Pookhay Mill (Parcel 143) farther south. On the south it was bounded by Nine Acres (Parcel 142), to the east by Catshill Ten Acres (Parcel 148) and to the north by 'Plot by Grove House' (Parcel 140a). By the time of the 1889 Ordnance Survey, shown below, Five Acres, had been combined with Nine Acres to form one single field. 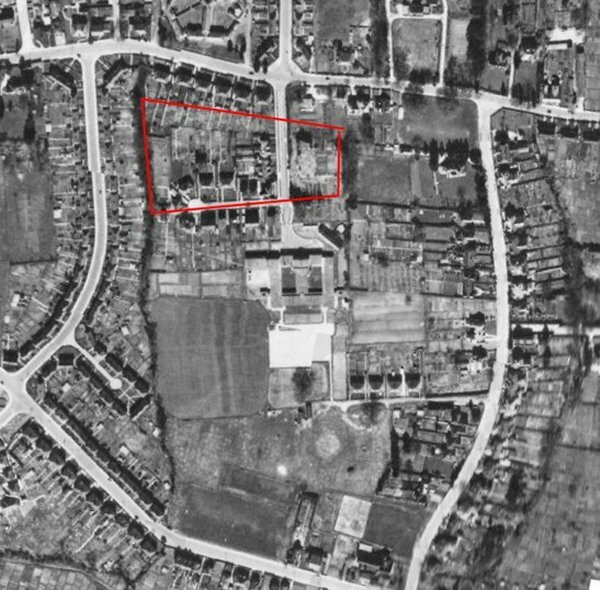 By the time of the 1946 aerial photograph Summerleaze Park had been laid out across what had been Five Acres, reaching as far as the former Nine Acres and Summerleaze Park School (now Oaklands Primary School) now occupied most of the rest of the field. 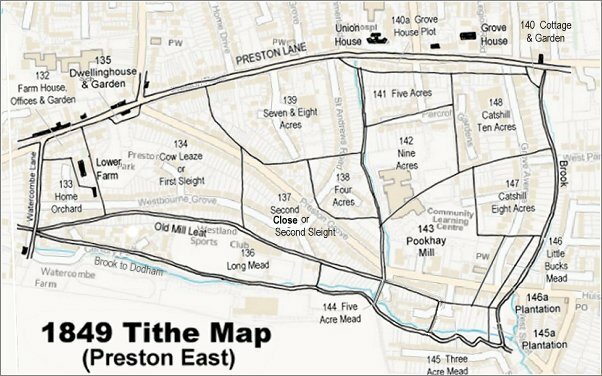 The 1849 Preston Tithe Map. Five Acres is at top, right of centre. 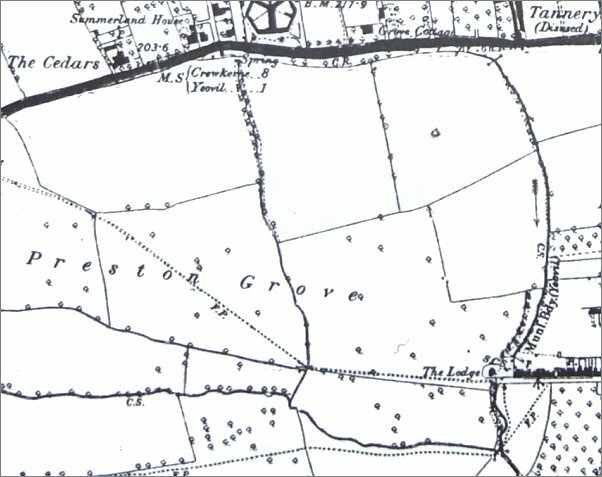 The 1889 Ordnance Survey shows the extensive fields of Lower Farm labelled 'Preston Grove' stretching eastwards. The dotted line across the fields, indicating a footpath, was the line of the later road, also called Preston Grove. Five Acres, by this time combined with Nine Acres, is the large rectangular field at top centre. The 1946 aerial photograph showing the approximate boundaries in red of the former Five Acres with Summerleaze Park occupying the eastern portion and its spur running east along the southern boundary. Preston Road runs along the top, Preston Grove along the bottom left while St Andrews Road is at left and Grove Avenue at right.